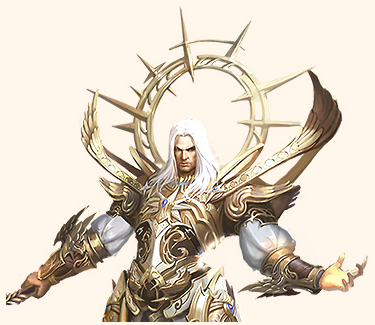 League of Angels (ValcoJoy) has just announced a Major Upgrade, including New Angel, New Heroes, New Mount, New Abyss and New System. Raphael is an angel commonly known as the “Healing God”. He treats not only the human body, but also the people’s faith. Aside from having always been happy, athletic and loving, Raphael also guards the tree of life, protecting it from those who wish to abuse its wisdom. His Flame Sword and endless powers make him the true incarnation of strength. For the people of Midgard, Asgard is a place so holy and far out of reach that praying seems pointless: the Gods will never show their blessings. The truth is that the Gods are more than willing to respond to the people’s prayers. Cause Light Envoy, who spends most of her time flying above Midgard, collects prayers from people and conveys them to the Gods. Now to save the world, Light Envoy has been sent to Midgard to represent the Gods and protect the people with her elegant beauty. The Moon Priest is the noblest priest of the Elf. She lives in the depths of the forest, guarding the temple of Luna, bringing moonlight to the world and leading people towards the light. Because of her responsibilities, she has been fighting on the front line against the Nibelungen for thousands of years. She will never stop helping people escape the darkness. The Celestial Hunter is the master of the powerful Icefield, which can awe other creatures. Celestial Hunter can be evolved from Floe Hunter, so only heroes who have already tamed a Floe Hunter can make a Celestial Hunter fight for them. Undoubtedly it will be a frightening presence in your team and help you defeat no matter what kind of evils. You will gain a certain amount of stars after you complete a floor for the first time. You will receive buff and rewards according to the amount of stars you’ve earned. You can win Abyss Coins in Abyss and buy items you want in the Abyss shop. There is Holy Gear, which is even better than Legendary Equipment. You can ask your friend to do you a favor when you explore Abyss. With each attempt you will have 3 chances to ask a friend for help. Come on and fight with your friends! In Fairy System, players could summon different kinds of fairies, which would keep company with players and bless the team with a bonus buff. With their hilarious dialogue and cute appearance, they are going to be your new partners. Originally known as 'Yokai Saga' in Korea and Thailand, an enhanced version called Phantom Chaser comes to the West. The highly-anticipated "Faction War" update for MU Legend releases today, bringing all-new content to the ARPG.